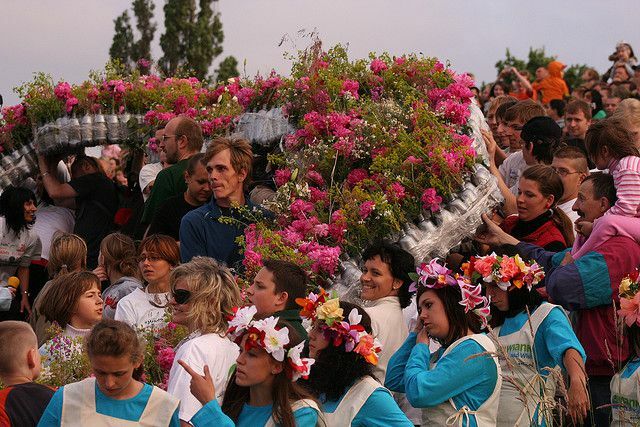 Wianki is a Midsummer Polish tradition with roots in pre-Christianity. “Wianki” means “wreaths” in English. This holiday is named after the tradition of floating handmade wreaths down the river as a part of a pagan summer solstice custom. The most famous Wianki celebrations happen in Krakow, but Wianki is recognized throughout Poland. Wianki was originally a pre-Christian fertility festival honoring the Slavic goddess of the harvest and love, Kupala. Kupala was associated with both fire and water as purification devices. During this time, called Kupalnocka, men and women formed couples and participated in wreath-floating and bonfire-jumping ceremonies. When Christianity came to Poland, efforts were made to Christianize the Kupala holiday, and it became St. John's Eve. Kupala's water rituals were then associated with John the Baptist and the baptism ceremony. Another name for the holiday was Sobótka, which relates to the word Sabbath, and in this context, it was implied that Sobótka was associated with evil spirits and witchcraft. Efforts were made to either extinguish pagan Midsummer rites or incorporate them into the Christian calendar, shifting their meaning. Despite these efforts, common summer solstice customs survived. In this way, Poles celebrate Wianki in a similar manner to how their ancestors celebrated Kupalnocka. Though Wianki has such a long history, Midsummer celebrations were canceled with the introduction of martial law. They were revived in 1992. Wianki, as a pagan tradition, was a part of summer fertility rites. Young women wove special garlands or wreaths out of symbolic herbs and floated them on the river. By the way, the garland behaved in the water, or if the wreath was retrieved by a favored suitor, the girl could make predictions about her future. Today, enormous community-made wreaths are floated down the river. Women also wear garlands during this time with a nod to the original wreath-making custom. However, the wreaths' connection with the future, fortune telling, and romance has been broken. Wreaths today stand for Wianki and midsummer celebrations and no more, though Poles still remember the garlands' original meaning. Wianki in Krakow The largest and most famous Wianki celebrations are held in Krakow on the banks of the Vistula River. Concerts, wreath-floating events, and fireworks are a part of the annual traditions. St. John's Fair, a medieval or Renaissance-type fair, is a part of Krakow's Wianki calendar of events. Held at the base of Wawel Castle, near where the fire-breathing dragon guards the banks of the Vistula, booths selling handmade crafts and traditional foods accompany cultural performances and musical entertainment. Wianki is a great opportunity for visitors to Krakow to experience world-class entertainment, sample traditional foods, buy unique souvenirs, enjoy annual customs, and party with the Poles. This event, however, will increase crowds during the most popular time to travel to Poland. How can you enjoy your Wianki holiday to its fullest? In a word: plan. First, identify the dates during which the Wianki festivities will fall. Then, research airline tickets and hotels. Book your reservations well in advance. During festive periods in Krakow, it can be difficult to find rooms close to the historic center, so booking ahead is a must. If possible, arrive a couple of days before Wianki so you can get your bearings and get a feel for Krakow. This Polish city offers plenty to see and do, so getting bored is an impossibility. While you're scoping out the historic district, you'll also be able to identify potential restaurants to try, cafes to relax in, shops to buy souvenirs in, and museums and galleries to explore. Cool down with an ice cream or a shot of Polish vodka after viewing Krakow's must-see sights. The official website for Wianki offers information about performers and the history of Wianki, as well as a calendar of events.